A very interesting option for several reasons: Here they are! You'll notice with the 20 ideas suggested here, that using Ikea storage unit provides an advantage that other options will not offer you. The light! With Ikea storage unit, light is not blocked! So if for you, privacy is not essential, if the noise between the two rooms doesn't bother you. that you are simply trying to delimit two distinctive rooms, but you do not want to darken a room by creating this separaton. 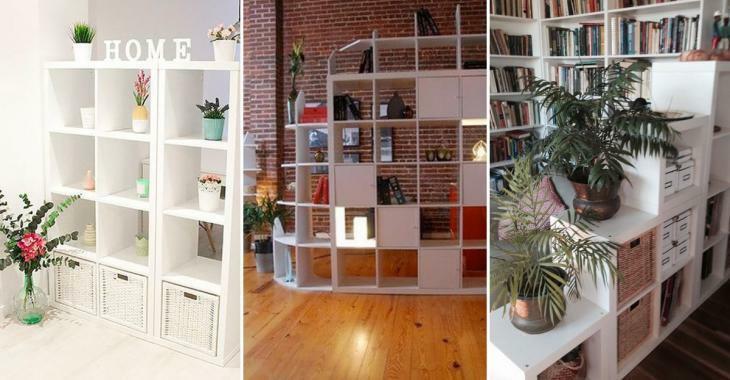 Well, consider the option of Ikea storage units, because they are cheap, beautiful and very useful for storage. 1) Three small shelves with white wicker baskets perfectly separate a dining room and a living room and allow you to add some decoration in both rooms ! 2) You can even decorate the side of the shelves ! 3) Add the baskets where you want ! 4) If you plan to make a library, close it to have more privacy ! Add cube storage and plants along the corridor. 5) To separate the entryway and the living room into an apartment, it's perfect ! 6) They perfectly match the brick and the wooden floor ! 7) In a loft, they are very useful to separate the sleeping area from the rest of the house. 8) Two teenage girls sleep in the same room? Here is a wonderful solution ! 9) Add storage cubes with other furniture for a surprising transformation ! 10) Add crates in colorful fabrics and mix the colors ! 11) They will be beautiful in an office cafeteria ! 12) Add a curtain rod to decorate your teenager's room ! 13) You can create you own decoration ! 14) They are very convenient to separate the double living room of the old apartments ! 15) Take the opportunity to add color to a room without color ! 16) Still missing space to store all your precious books ? Here is the solution ! 17) Choose the color according to your decor ! 19) Let in the sunlight ! 20) And finally, you can even create a small bar area!